The 62-year-old singer died from kidney failure last month after fighting cancer and pneumonia and suffering from a serious bowel condition. Barry, the sole surviving member of the Bee Gees trio, had a trembling voice as he told the congregation at St Mary's Church in Thame, Oxfordshire: "Life is too short. In Robin's case, absolutely too short. Referring to the late Maurice Gibb, who died in 2003, he added: "When you're twins, you're twins all your life. You go through every emotion. "And they're finally together. I think the greatest pain for Robin in the past 10 years was losing his twin brother, and I think it did all kinds of things to him. And now they're together." 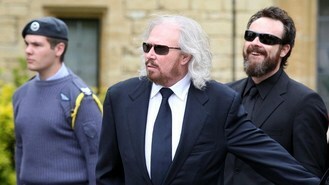 Robin's elderly mother, Barbara, left the church just before Barry - the last of the four Gibb brothers - gave his eulogy. Mourners wept as Robin's ornate white coffin entered the church to the sound of the Bee Gees' hit How Deep Is Your Love. Close relatives, including Robin's widow, Dwina, and his mother followed behind. Hundreds of well-wishers lined the streets to pay their respects and see his coffin being taken to the church in a horse-drawn carriage. The cortege was followed by Robin's two Irish wolfhounds, Ollie and Missy, together with friends and family. Guests in attendance included Sir Tim Rice, DJ Mike Read and Uri Geller.